Bianca is a Criollo x Thoroughbred polo pony mare, standing about 15.1hh (155 cm) high at the shoulder. In June 1998 she had a very conspicuous, large, cream-coloured foal by our Irish Draught stallion. While we were on holiday in late August 1998, Bianca and her foal were grazing with our other horses on a 16 acre block of land adjacent to our farm, which is situated in a hilly area of Carmarthenshire, West Wales, with high hedgerows, linear woodlands along streams, and larger blocks of natural or planted forest. When we returned home on 29 August, the foal was nowhere to be seen and Bianca herself was behaving in a very disturbed way. She would not allow us to catch her for several days. On 31 August, a second, large, purebred Irish Draught foal, 1 month old, collapsed and died of shock despite emergency veterinary treatment. On post mortem in the Veterinary Investigation Laboratory in Carmarthen, this foal was found to have long, fine scratches on the inside of both back legs. We finally succeeded in capturing Bianca on 2 September. When her mane was clipped, she was seen to have a large U-shaped bite, 7cm in diameter, underneath it on the crest of her neck. On the right-hand side of her neck, where the teeth had penetrated, the carnassial puncture wound seen on the left was 2.5 cm deep. The canine teeth had not sunk in very far and the punctures had already scabbed over. On the left-hand side of her neck a matching jaw impression was visible but the teeth had not penetrated. There were no other bite marks anywhere on her. In addition, Bianca had three clusters of puncture wounds made by needle-sharp claws on the right-hand side of her neck and one on the left. There was another mark on her right flank, apparently made by the claws of a hind foot. All the puncture wounds were septic. The vet was called and confirmed that the wounds were consistent with an attack by a large cat. On his advice, Bianca's wounds were syringed out twice daily for three weeks. The muscles of her neck were so badly mauled that when the teeth punctures were syringed out, water poured out of the adjacent claw punctures carrying strips of necrotic muscle tissue. At 5.40 pm on 17 September, my husband Alan Perrott saw a large brown cat with a lighter underbelly in the field where the horses were attacked. He had previously had a much closer (50m) sighting of a puma in the same field, also in broad daylight, about two years earlier. The size and shape of the bite on Bianca's neck are consistent with the dentition of a puma (see photo). 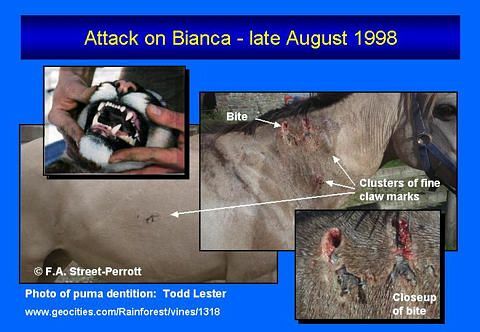 I showed a picture of Bianca's wounds to the participants at the 6th Mountain Lion Workshop in San Antonio in December 2000. They agreed that they were consistent with an attack by a medium-sized felid such as a puma or conceivably, a lynx. Phebe Cooper and I found the disarticulated bones of Bianca's foal, including the skull, on 26 June 1999 in dense riparian undergrowth on our farm. They were scattered under the leaf litter in a shallow, saucer-shaped depression concealed by overarching branches and brambles about 80cm high. This location was separated from the neighbour's field where the horses had been kept by a sheep fence about 1m high, a stream, and a steep stream bank. When we followed the stream uphill, we discovered the bones of several sheep, one skeleton still articulated, in similar situations under overarching vegetation. The photographs are reproduced on this website with my permission and are the only authorized copies on the web. I was able to see the Bianca picture in its enlarged version where it is much more clear. The deep punctures show where one canine entered much deeper than the other. The marks directly below, show how the lower canines didnt penetrate, but caused much abrasion as the lower jaw was continuously trying to maintain a hold. It appears to be be one single bite, but this had to be a very strong predator. If this was a cat, there should be smaller claw punctures above the bite wound where the cat would anchor its claws prior to the bite. If this was a dog, I would expect to see many bites along the horses lower section. Dogs and wolves are known to exhaust the victim by numerous bites to the back side. From what I can see in the photo, there is nothing inconsistent with a feline attack, but nothing to thoroughly discount a dog either. No to bites to legs and backside, yes to clawmarks. Dogs would have made a commotion which would have been heard easily in that particular place, and in any case the rest of the horses (including stallion) would have sorted out a dog attack. The missing foal was lifted clean over a fence, and no dog could have cleared that height with a burden of that weight. Many thanks for your interesting comments. Thinking about it, I cannot imagine any kind of dog leaping 5 ft up onto a horse's back and holding on with its claws. Horses with foals seldom lie down. BIanca was one of a herd of more than a dozen horses, some of which were very large (massive purebred Irish Draughts weighing 600 - 800 kg) and including two stallions. Dogs may have the courage to bark at a horse but in my experience they rapidly learn that if they attempt to bite they will get fired into space and very likely killed. Horses have instinctive kicking and stamping reflexes where dogs are concerned - probably evolved to deal with wolves. Whatever killed the foal must have stalked it without alerting the stallions. There were three clusters of four claw marks on Bianca's right shoulder and one on her left. These appear as large pus-filled bumps on the photo. The actual puncture wounds suggest needle-sharp claws and penetrated right into the muscle. We live in a very hilly area of fenced, 40-100 acre sheep farms (improved short grassland) with small patches of woodland and streams. 90% of all the farm dogs are Welsh collies with narrow, V-shaped jaws that do not correspond to the shape of the bite. Loose dogs are easily seen or heard running over the hillsides, e.g. from the main road, and are promptly rounded up or shot. Draconian financial penalties can be imposed under English law on owners of dogs that worry farm animals such as sheep. My husband, who is very familiar with the African big cats, twice saw a puma in broad daylight in the field where the horses were attacked - once from only 50 yards away. He actually followed her on foot across the field before it dawned on him that this was not entirely wise! One of the sightings was only 3 weeks after the attack. Puma sightings in our area (the so-called Beast of Brechfa) began around two years after the 1976 Dangerous Wild Animals Act, which resulted in the deliberate release of at least 4 captive pumas (Phebe will correct me if I'm wrong) within a 50 km radius of our farm. I know personally of around 50 people who have seen one - a couple of weeks ago the local forestry manager and two members of his family watched a large male puma for 10 minutes with binoculars from a bedroom window as he strolled across adjacent snow-covered fields at 1pm (Phebe - sounds like The Old Boy again). They were understandably somewhat shaken - and quite forgot to take pictures, unfortunately. I had seen some of the images of the horse being used by BBCS but this was the first time I read Alayne's testimony. It's a very powerful description and completely compelling and believeble that her horse and foal were attacked by a puma type cat. Particularly the finding of the foals remains. This is poignant because I'm sure it would have been upsetting as well as unnerving when they realised the kiling had been carried out by a large feline predator and here was the evidence right in front of them. The diameter of the bite on Bianca was 7 cm and the deepest carnassial tooth puncture penetrated 2.5 cm. However, the muscles inside her neck were so mashed that the latter figure can be assumed to exaggerate the tooth size. I saw a splendid television documentary a year or two back about mustangs (feral horses of European origin) in California. The major predator of mustang foals is the puma. Probably the cats do not attack adult horses all that often, but there have been several recent reports of attacks on horses from North America on the easterncougar e-mail bulletin board. I have read of others in Argentina/Chile. In the case of our horse Bianca, it seems likely that the mare was attacked while trying to defend her foal, which was dragged off and eaten. However, in North America inexperienced young pumas, especially young males with too much testosterone, can attempt all kinds of unsuitable prey and may get wildly excited when they draw blood - this is the usual explanation for the multiple sheep kills that occasionally occur on ranches in Texas and Arizona. Leopards can successfully attack wildebeest, which are not dissimilar in size and weight, by biting the underside of the throat - so why not horses? Having said which, it's really not possible to tell until we can see the pictures. And we shouldn't forget that horses - especially colts and stallions - can cause quite severe injuries to each other! Alayne, nice to read an informed opinion on puma predation of horses. I agree with your comments 100%. I have images of a dead colt with throat punctures that was found under a massive mound of leaf litter attributed to puma. This image comes from the manual of puma and jaguar predation and was sent to me by a scientist at the USDA. Horses are far from unusual as items of prey in the puma diet. Similarly the puma tracker Warner Glenn describes frequent losses of colts to puma. The subject of puma attacks on horses has been discussed frequently. I have more or less concluded that it does occur often with foals, as well as other immature domestic hoof-stock. On the occasions when adult horses are attacked, I believe this is a matter of the horse defending its young, then sustaining injuries in the process. In the matter of multiple kills of smaller livestock, the author G.A.W. Guggisberg addressed that issue in his book "Wildcats Of The World". He explained that in extremely rare situations, the puma might be so overwhelmed by many animals confined to a small area that the cat's killing instinct is activated and re-activated repeatedly, causing it to kill more than what it might need. This would be extremely rare, but I would reject the idea altogether. While this blood lust may occur in canines, I have found no evidence that it occurs in felines. The survival of all solitary cats is predicated on practical needs, rather than impractical instincts. There have been many reports of cougars perpetrating large kills, as many as 192 ewes in one single night. Many of these reports defy logic and would be considered physically impossible. In early years, these false reports were made for the purpose of extending or increasing bounties paid for wild cougars and in some situations, ranchers were able to recieve reimbursement for losses. Leopards however are known to kill very large prey. The physical attributes of that cat are much different than those of the cougar. While both cats have a very low stamina compared to other animals, the killing techniques of the leopard do allow it to kill more quietly and swiftly than the cougar. My opinions, and of course opinions vary. A photo of one of the injured horses is available online at www.westernmorningnews.co.uk. If you enter 'big cats jessica' in the search box on the main page of the site it will be first search result. Regarding puma attacks on horses, these seem to be more frequently recorded and accepted in South America than in North America. This may be due to sub-species variation, or to the cats being more wary in areas of higher human population. There is also a danger in assuming that all pumas will behave in the same textbook way, and not allowing for individual differences. Some farmers go for years without a lamb being killed by foxes, then one fox may start killing lambs, and, if a vixen, will train her cubs to do the same. The more intelligent an animal is, the less it will act purely on instinct,and the more its behaviour may differ from the norm, and pumas are highly intelligent animals. Having said that, the injuries to the horses in Devon happened on a night of high winds, and heavy storms. They were not used to being left out at night, and were loose only because they were already so 'spooked' by a fireworks display that the owner could not catch them. Under these circumstances they could have injured themselves, or each other, as Alayne points out. During the Felicity saga in Cannich, the late Ted Noble, who eventually caught her, saw a 'large tawny creature stalking his shetland ponies and lost several shetland foals. He also lost an adult mare due to her injuries but his statement didn't mention what they were exactly but her foal had gone missing so again this is probably an example of a mare defending her young.